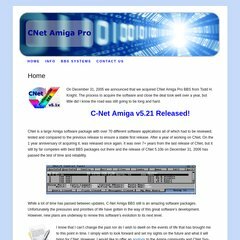 Topics: Cnet Bbs, Info, Bbs Systems, and Storm's Edge Technologies. Age: The domain is 20 years and 3 months old. It is written for PHP/5.3.2-1ubuntu4.5 language. Its 1 nameservers are ns1.setsrv.com. Charter Communications Missouri is the location of the Apache/2 server.